To be completely honest, I had very low expectations for this film. I know I shouldn’t judge a book by its cover, or in this case a movie by its poster, but <Inside Me> just didn’t seem like it had a lot going for itself. On the EonTalk Facebook post on “Korean Movies Upcoming in January 2019,” I gave this film a 5/10 expectation. However, I was proved wrong once again (which is a great thing!) and <Inside Me> was actually a satisfying comedy flick. <Inside Me>, directed by Kang Hyo-Jin, features a lineup of well-known Korean stars: Jinyoung of B1A4, Park Sung-Woong, Ra Mi-Ran, Lee Soo-Min, Lee Jun-Hyuk, Kim Kwang-Kyu, and more. The unofficial title used by EonTalk for this film on contents such as the English subtitled trailers was “The Man Within,” which is the literal translation of the Korean title “내안의 그놈”. However, the official English title was released after the release of the film, which is <Inside Me>. The movie is a comedy about two men changing bodies, and takes the viewers through humorous episodes of scenes similar to the lines of <Freaky Friday>. Pan-Soo (Park Sung-Woong) is part of an exclusive organization known for partaking in illegal activities. AKA, he’s a thug. 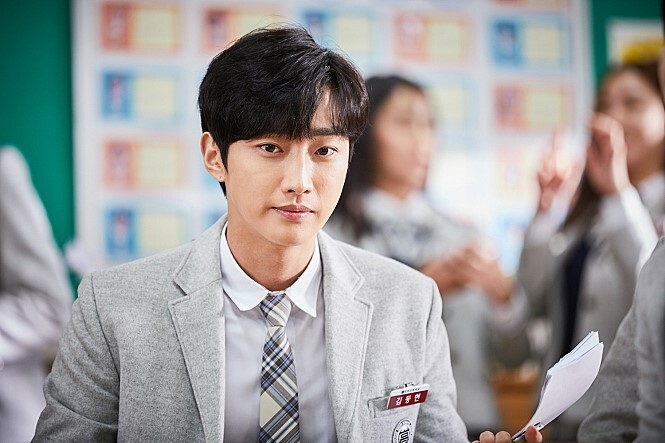 When he visits a small, local restaurant to grab an old-time favorite meal, he comes across Dong-Hyun (Jinyoung), a high school student with obesity problems and is bullied at school. The owner of the store mentions some odd expressions, leaving Pan-Soo puzzled. Moments later, Pan-Soo and Dong-Hyun’s fates cross paths again. Dong-Hyun falls off the roof of a building following an unfortunate accident, landing right on top of Pan-Soo. Following this incident, the two switches bodies. As Pan-Soo inevitably lives his life in the body of an overweight high schooler, he meets his first love from the past, and finds out he has a hidden daughter! Things just get weirder and weirder for the duo. As mentioned before, <Inside Me> was a very light and funny movie. And that’s its biggest positive feature. The comedic points that the film had were genuine humor that didn’t’ feel forced. You know how some films tend to try too hard in making the audience laugh? (cough cough* <Too Hot to Die>). Well, this wasn’t like that. Yes, it does have some level of cringeness to it, which I’ll get to later, but overall was a good, amusing film. Building on the feel-good tone, the Korean version of <Freaky Friday>, as I like to call it, had lots of good and bright music to accompany the lively mood. The musical composition definitely added positive value to the movie. Furthermore, the movie had some surprisingly good action. I say surprisingly because this movie is a complete comedy, meaning the sole purpose of the film was to amuse and entertain in a humorous manner; action sequences are the last thing you expect. However, there were sprinkles of action scenes near the end that were pretty good. And lastly, the performances by the actors were great. Ra Mi-Ran, Park Sung-Woong, and Jinyoung’s acting were really what communicated laughter to the viewers. The story itself wasn’t the best, and if delivered incorrectly, it could’ve come off as very cliché. Two people switching bodies? Very original, right? (No, that was sarcasm). What really stood out was Park Sung-Woong’s acting. His depiction of Pan-Soo, the thug, in the beginning is really what built the narrative, and then his portrayal of Dong-Hyun, Jinyoung’s character, when they switched was hilarious. Moreover, I can’t conclude this review without mentioning Jinyoung. For those of you that may not know, Jinyoung is a K-Pop idol of the group B1A4. And K-Pop artists have a huge barrier when entering the acting industry. They need to prove themselves as not only a musical artist, but as an abled, talented star. <Inside Me> was the first acting performance I saw of Jinyoung, and I have to say it was very good. I believe the role of Dong-Hyun really fit him as a person, and it just felt very natural. I mentioned in the “Good” part that despite being a humorous film, there were elements of cringeness to it. Also, I said that if the story was delivered in the wrong way, it could come off as very cliché. Although the movie overall did a very good job in executing the delivery, I can’t say it completely got rid of the cheesiness. It did have bits of over-the-top, cringy tendencies. However, I believe the good outbalanced the bad, and was in general an entertaining movie. The biggest downfall of <Inside Me> was that the movie didn’t really have a purpose. As I said before, it’s a comedy and only a comedy. It didn’t have enough drama to be considered a melo, nor did it have enough action to be considered an action film; not even close. That being said, a loyal reader of EonTalk knows that I separate a “good” movie from a “great” movie in its purpose; the meaning behind the movie is what makes it an amazing film. Unfortunately, this movie does not have real significance (or at least none that I was able to take away). And lastly, the film felt slightly on the long side for a “light” film. The running time was 122 minutes, and for a movie that should be watched on a laid back, simple night, 2+ hours seems like a bit too much time to invest. An ideal duration would be more along the lines of 90 to 100 minutes, in my opinion. If you’re looking for something to watch to just lay back and laugh, I would recommend <Inside Me>. It’s a good light film to turn on and just chill and laugh. However, do not expect too much from it. Other than the comedic elements, it doesn’t really offer much more. I will say that it is much better than what the trailers portray it to be, so don’t let the previews trick you.